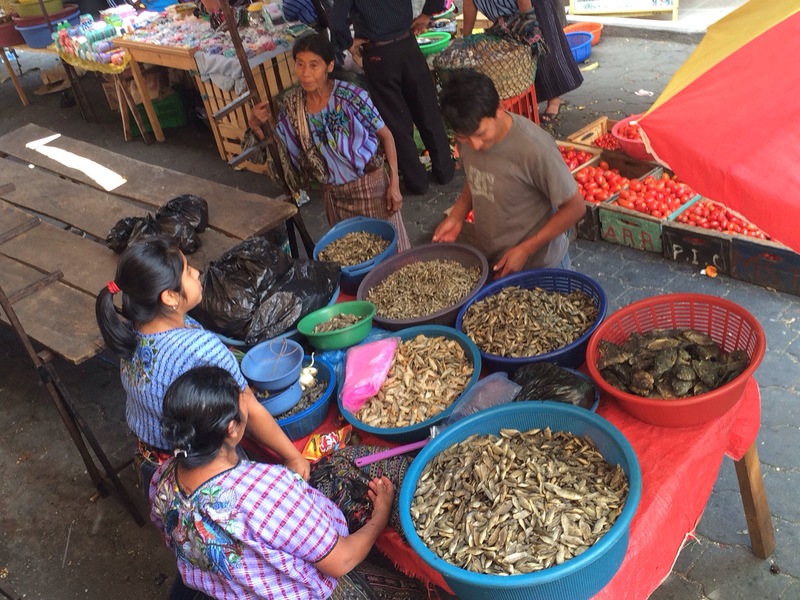 Santiago is a mostly indigenous Mayan community of around 50,000 people on Lake Atitlán. The locals speak Tz’utujil (pronounced two-two-hill). There are a handful of ex-pats who also live in Santiago. Women and most of the young females wear traditional woven stripped long skirts and huipiles, shirts embroidered with colorful birds and flowers. Some older men still wear white-striped embroidered pants. It’s incredible to see most of the community still abiding by tradition. The vibrant colors and patterns are hypnotizing. 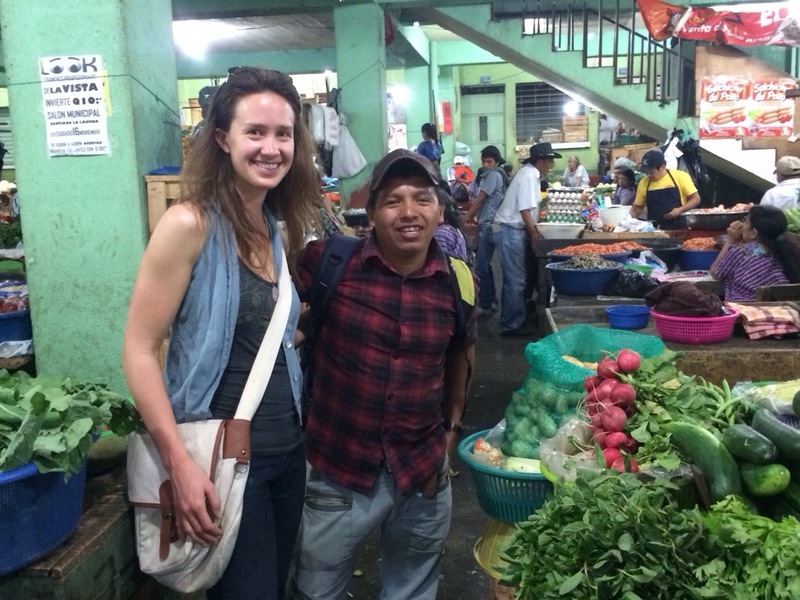 I went to the market with Pedro, the farm chef who’s a Santiago local, and Elise, another volunteer at the farm. I thought I went to the market the last time I visited Santiago, but I missed the whole indoor section, which is the meat of the market. 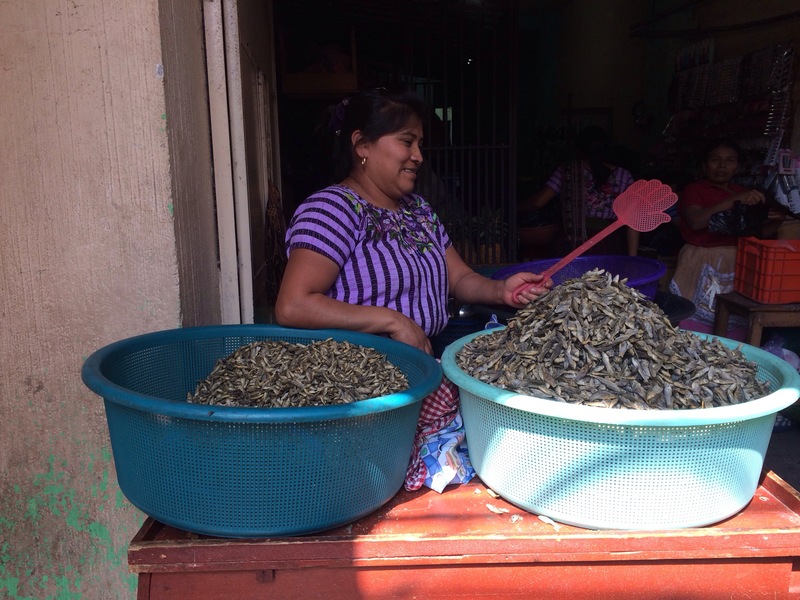 I only ventured as far as the outdoor vendors, where all the other gringos go. It was awesome having Pedro as a guide. 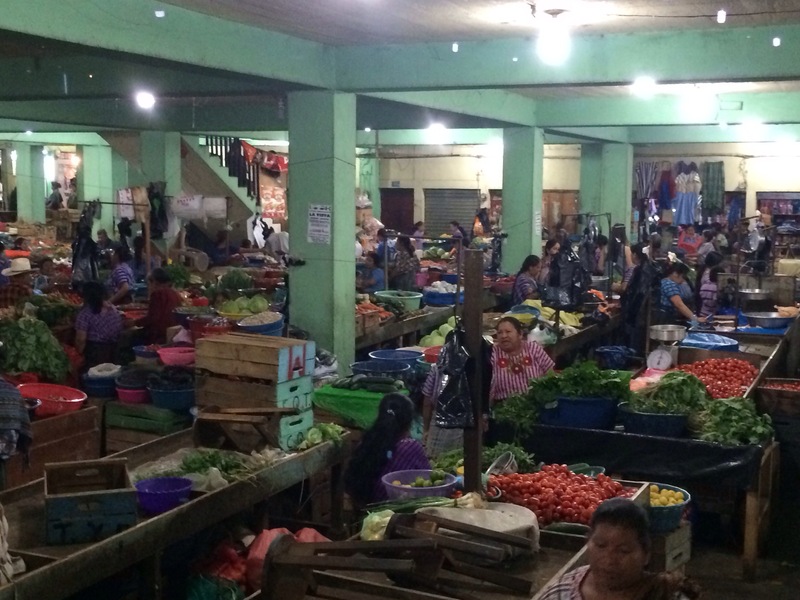 The market is where all the locals buy their food. 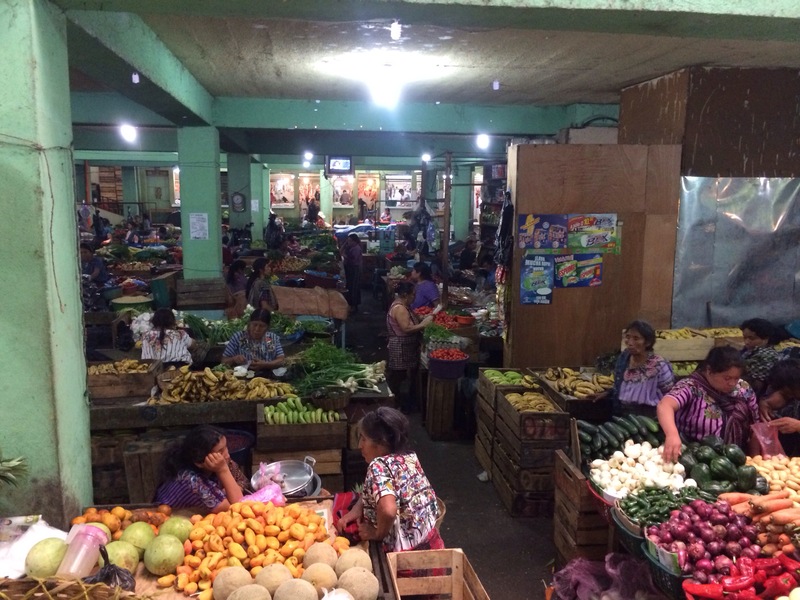 It’s an open-air outdoor market with multiple floors. We entered the market at the meat section. 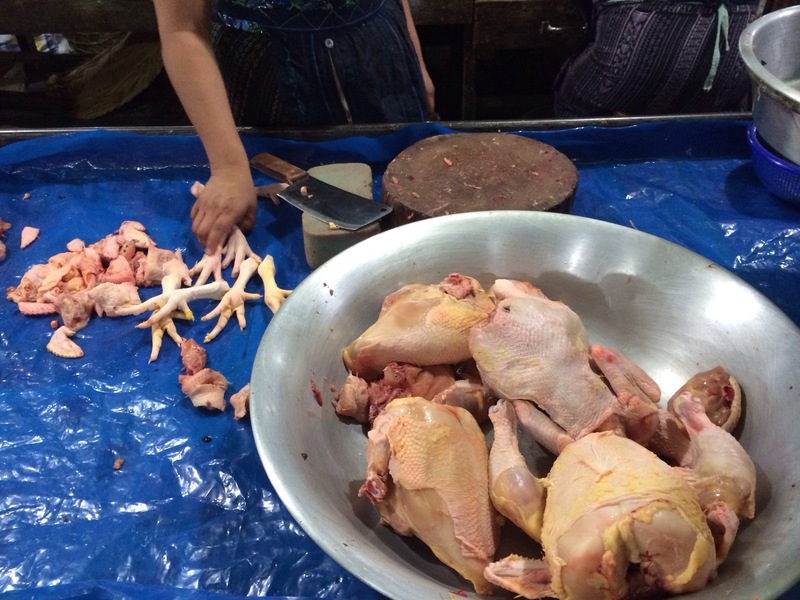 The smell of raw meat instantly infiltrated my nostrils. I sucked in my breath so the smell couldn’t completely take over. Skinny, stray dogs brushed past my feet. Dirt, skins of vegetables, trash, empty chip bags and plastic bags covered the concrete floor. As Pedro bargained piña prices, I looked around. 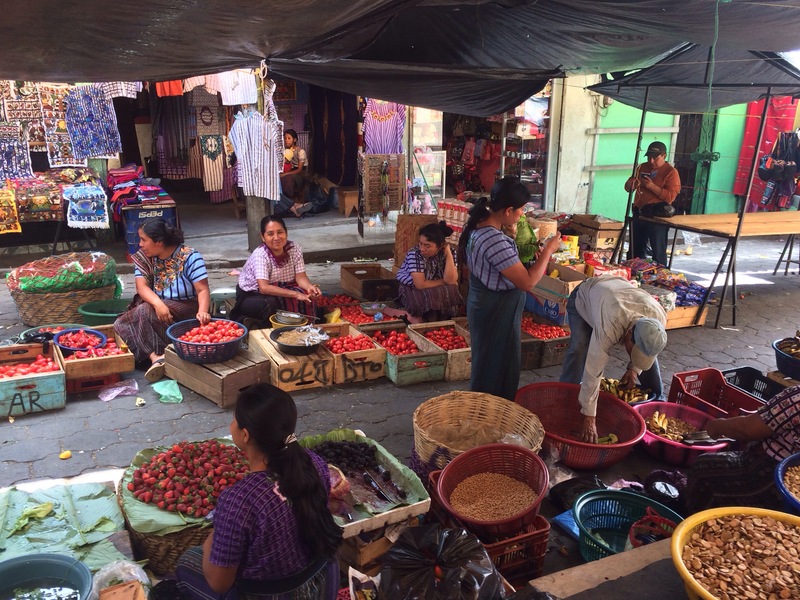 I felt like a giant as five foot tall men and women quickly weaved their way through the narrow paths between fruit and vegetable sellers, bumping into me like I wasn’t even there. On the first floor people mainly sold fruits, vegetables and meat. 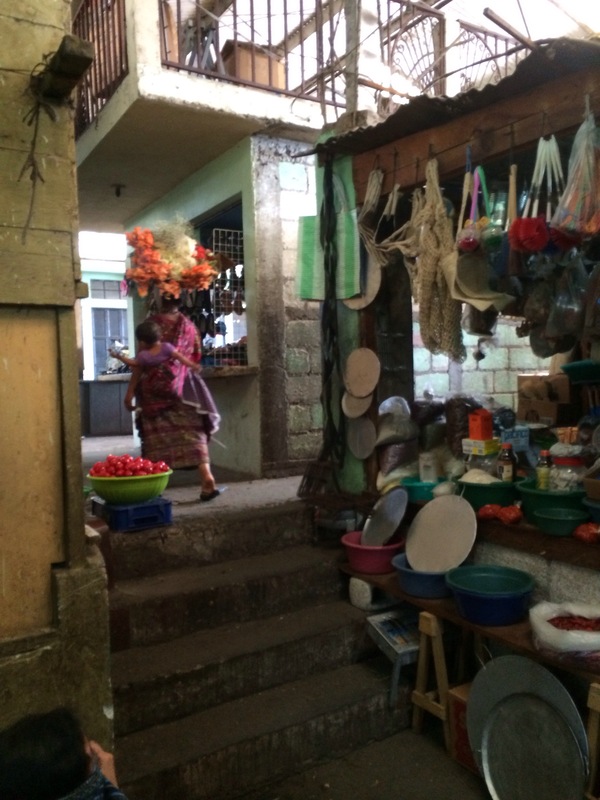 Women lined the staircases, sitting on each step with baskets of dried beans, rice, fish or tortillas. I walked around in awe as barefooted women swerved in between each other while balancing baskets of food on their heads. Meanwhile I almost slipped on aguacate grinds multiple times. I followed one woman who balanced a huge bouquet of beautiful flowers on her head while carrying her baby on her back. This was the closest picture I could get. Observing how other cultures function on a day-to-day basis is so fascinating to me. I feel energized and alive as I take in new surroundings. I love experiencing how different life is in different parts of the world, regardless if it’s pretty or challenging or ugly or bittersweet. Traveling opens your eyes and broadens your perspective to reality in ways that nothing else can. 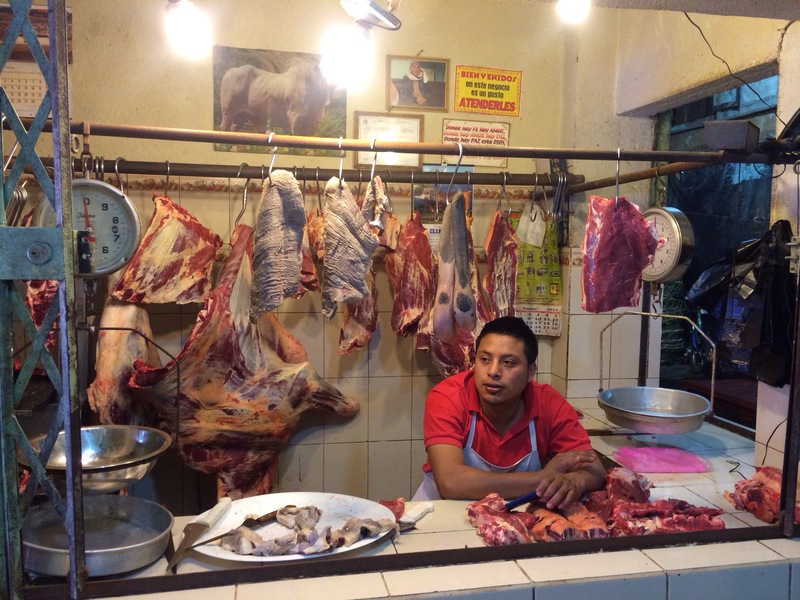 Pedro lead us through back roads to enter at the meat section, but you can enter from main roads as well. From the dock: walk up the main road. Turn left at the restaurant El Pescador. That’s where the outdoor vending begins. I went on a Friday, which is a busier day. This entry was posted in Guatemala, Travel, Travel Tips and tagged april stolarz, april stolarz blog, april stolarz wordpress blog, aprilsfestivals, blogs about Guatemala, blogs about Latin America, blogs about Santiago Atitlán, blogs about Santiago Atitlán guatemala, daily life in Santiago, exploring Lake Atitlán, Guatemala, how to travel to Guatemala, indigenous communities Lake Atitlán, latin america, life in Santiago Atitlán, local life in Santiago Atitlán, Market Life in Santiago Atitlán, Mayan communities in Guatemala, Mayan communities Lake Atitlan, Mayan towns in Guatemala, Mayan traditions, mayans in Lake Atitlán, pictures of Santiago, pictures of the market in Santiago, Santiago, Santiago Atitlán, Santiago Atitlán guatemala, smile and be free, smile and be free blog, smile and be free wordpress blog, stolarz, the mercado in Santiago Atitlán, things to do in Lake Atitlán, towns around Lake Atitlán, Travel, travel blogs, travel blogs about Guatemala, travel tips, traveling in Guatemala, traveling in Santiago, traveling in Santiago Atitlán, traveling to Guatemala from the States, traveling to Latin America, traveling to Latin America from the US, US citizen in Guatemala. Bookmark the permalink. Thanks Tio Doug! It’s incredible to experience!